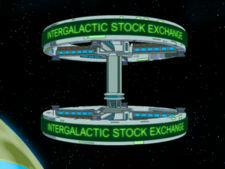 The Intergalactic Stock Exchange is Earth's foremost business place and also used by a lot of alien races and robots. The stockbrokers are mostly robots specially adapted for the purpose, with multiple arms and so on. 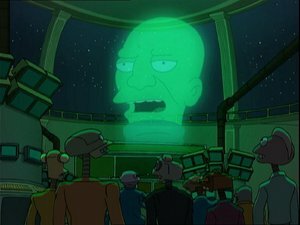 Among its personnel is Jor-El, Master of Scheduling, a kind of head-in-jar making public announcements via holographic projection. The space station is clearly a spoof of the station seen in 2001: A Space Odyssey, and Jor-El has its origins in the 1978 Superman movie, where a similar entity could be seen on Krypton. The message "Please help avoid stock market crashes, drive safely." can be seen scrolling around the ticker. The ISE's top is on to Ereğli,Turkey and bottom of the ISE on to Cairo,Egypt. This page was last edited on 30 November 2013, at 17:03.